How to get longer (stronger!) hair. While bobs and lobs are still trending, many of us still desire longer lengths when it comes to our locks. While there are a lot of hair growing myths out there, only a few of them rank as fact and not fiction. To get you started on your path to longer hair, we share a few hair growth secrets below that can actually work! Although cutting the dead ends doesn’t directly affect how fast your hair will grow at the roots, it does help in the length department. When you don’t go for regular trims your hair is likely to split and break at the ends, causing it to look straggly, and thereby counteracting any inches you may have grown over the last few months. To play it safe, schedule a hair trim every 4-6 weeks. This will keep your ends split-free and help you to grow longer, healthier hair. Even though you may think that lathering up in the shower can cause your hair to shed, think again. 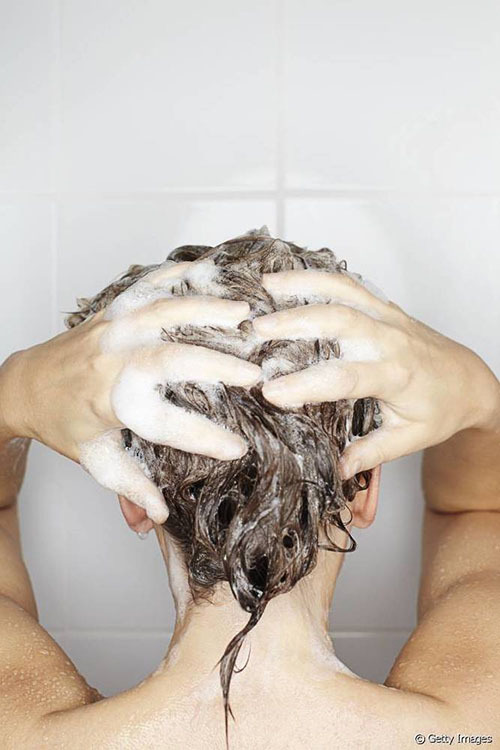 Hair naturally sheds an average of 50-100 strands a day and often most of those stray hairs are lost in the shower. Failing to lather up in hopes of holding onto those strands longer can actually have the opposite effect. When left unwashed for prolonged periods of time, the buildup of oils, product, and debris on the scalp and hair can clog the follicles and lead to further hair loss. To keep your hair growing longer and stronger, keep your locks clean! If you worry that over-shampooing is drying out your hair, consider switching to a cleansing conditioner in between washes. Did you know that stress is one of the leading causes of hair loss? As if feeling stressed out wasn’t bad enough, this negative emotion can often have a negative effect on your locks-causing everything from shedding to drying, to even brittle strands. To help you grow longer, stronger hair, consider taking a moment each day to de-stress through either yoga or even just a nice long bath. One of our favorites? Give yourself an aromatherapy-infused, essential oil scalp massage once a week. This will help to boost circulation and can even help you grow longer hair! The age-old adage is true; you are what you eat … especially when we’re talking about hair. Your locks need lots of vitamins and nutrients to grow long and strong. Cut out the processed foods and refined sugars in favor of seasonal fruits and vegetables high in nutritional content. Biotin-a B vitamin-is especially great for hair and can be found in everything from bananas to bok choy! Just as you want to eat healthy foods for healthy hair, you’ll also want to ensure your locks are getting the hydration they need inside and out. Drink a healthy amount of water each day and follow a hydrating haircare routine to help strengthen your hair and prevent breakage and split ends.